Pioneering a new local economy in Brighton where society, the planet and YOU matter. How do you fancy helping a bold new kind of supermarket show the big ones how it Should be done?!! Unit 1, 20-21 York Place, Brighton BN1 4GU. We’re hiSbe Food CIC and we think that after 50 years of doing their thing, the big supermarkets have become out of date and out of touch with people. It seems they’ve got carried away with what their shareholders and directors want, instead of doing what’s right for their customers, they’ve been putting profit before people and they’ve got so big and powerful that what they do affects our health, our communities, workers and the planet. Look at the recent horsing around with our burgers! Supermarkets are almost entirely responsible for the food we buy, but how can we trust them to do the right thing with our food when they don’t even know what’s in it…? Maybe the big supermarkets think that food is just another business and it’s not up to them to help people make good shopping choices, but we disagree. We think supermarkets need to upgrade for the 21st century and find ways to help everyday people afford food that’s been produced in a healthy, responsible and sustainable way. That’s just how it Should be! hiSbe stands for how it Should be and If you agree with us, maybe you would like to help us get our ethical supermarket started. Our plan is to open a pilot store in Brighton at Unit 1, 20-21 York Place, Brighton BN1 4GU. We’ll run it the hiSbe way and see what shoppers think of it. If it takes off, we’ll open more stores wherever communities tell us they want them. Anyone and everyone can help us finance our Pilot Store through Buzzbnk, from as little as £10 to up to £500. See https://www.buzzbnk.org/hiSbe for details. For investors of larger amounts, we are also gratefully accepting loans. 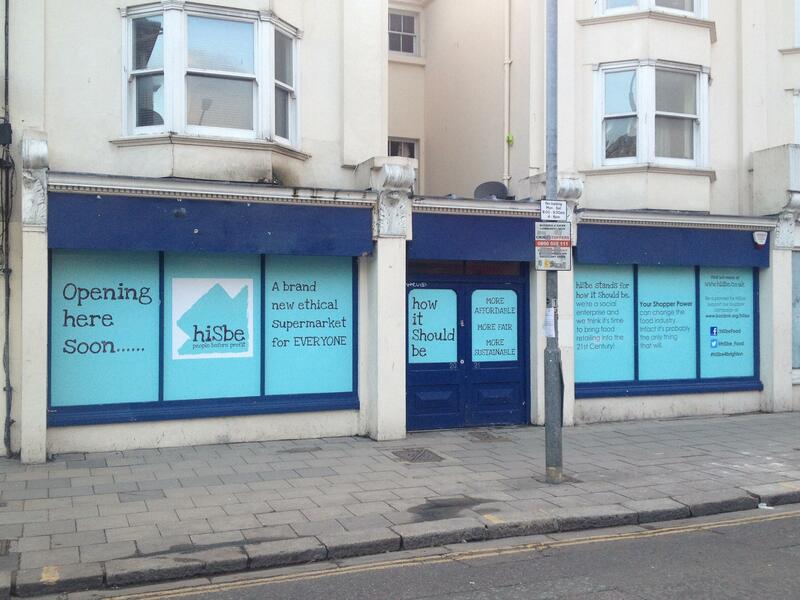 If you would like to consider lending hiSbe money, please email us at hello@hisbe.co.uk. This entry was posted in Brightoneers and tagged agriculture, Brighton, Business, England, ethical, everyday choices, fairtrade, farming, Food, food and diet, Food and Related Products, food for healthy, Food Standards Agency, good food, healthy food, hisbe, how it should be, people before profit, Retail, Supermarket, supermarkets, sustainable on April 28, 2013 by ruthanslow.